Vaervenshyael charged the zombie mass while they were distracted by Van Duster. She pierced and dodged her way through five of the undead, with Tankred and Van taking out the others. With the above ground threat out of the way, she returned underground with Wilhelm and Tankred to find the Slaan skin. All others headed back to Padua with Friebald's quick-spreading Nurglish Rot. 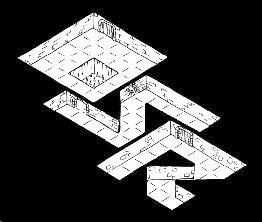 The party followed unexplored corridors to the circular center of the megalith. The journey was dangerous but to the mind rather than the body. Vaervenshyael saw carvings and depictions of mutating processes that raged against her stalwart elvish mind. Droop the Goblin wanted to get in good with his new masters. They were interested in finding Cragmaw Castle, and Droop led them straight there. As soon as the party could see the castle through the forest, they stopped. They sent the mage/thieves ahead to scout the perimeter. While circling the perimeter, the two noticed a concealed entrance on the far side of the castle. This entrance was quickly selected as their entry point, over the front and side doors which were heavily guarded. The concealed entrance led to a ruined tower. There was an entryway to the south, covered by a heavy curtain. There was a door to the east and a crumbled ruin of a wall with a small hole at the top to the northeast.